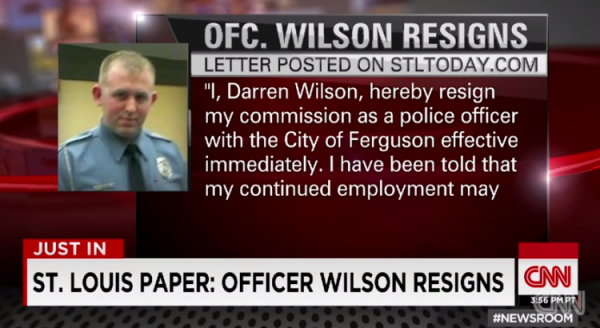 Following the decision by the grand jury to not move forward with murder charges Ferguson police officer Darren Wilson has decided to resign from the police department. The story was broke by the Associated Press, Wilson, who has been on administrative leave since the Aug. 9 fatal shooting of Michael Brown, resigned effective immediately, said his attorney, Neil Bruntrager. He declined further immediate comment. The Brown family attorney, Benjamin Crump, didn’t immediately return phone and email messages from The Associated Press. Wilson told the St. Louis Post-Dispatch he was stepping down out of his “own free will” after the police department told him it had received threats of violence if he remained an employee. The grand jury spent more than three months reviewing evidence before announcing Monday that it wouldn’t indict Wilson, igniting violence among protesters that resulted in at least a dozen commercial buildings in the area being destroyed by fire. 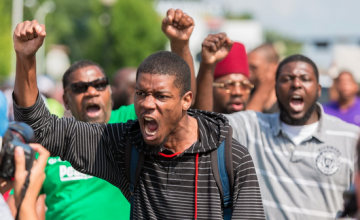 Several other large but peaceful protests have since been held in Ferguson and across the country.